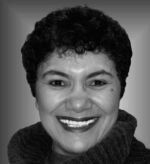 Sharon Robart-Johnson has a rich cultural background comprised of both African and European ancestry. She is a thirteenth generation Nova Scotian and part or her heritage dates back to the early slaves who were brought to the Digby County, Nova Scotia area in the late 1700s and to the Black Loyalists who arrived in Shelburne (Nova Scotia) in 1783. Her passion for researching Black history began in 1993. Sharon is a Board member of the Yarmouth County Historical Society which owns and operates the Yarmouth County Museum and Archives. She has five years of archival experience and holds the position of Publications Chairperson for the Society.